About 3 Weeks, 21 Hours, 59 Minutes ago. 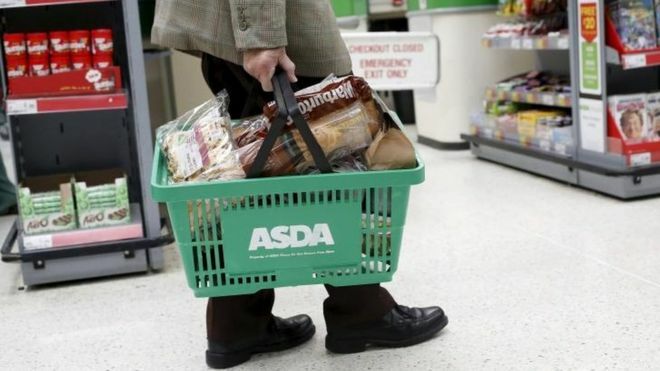 Asda has overtaken Sainsbury's to become the UK's second-largest supermarket, figures suggest. Asda's sales rose 0.1% in the 12 weeks to 24 March taking its market share to 15.4%, research firm Kantar said. In contrast, Sainsbury's sales fell 1.8% over the same period, meaning its market share dropped to 15.3%. The two supermarket groups are currently struggling to persuade the UK competition watchdog to allow their proposed £7bn merger to go ahead. The duo have argued that the tie-up will save them £1.6bn and allow them to pass on £1bn in price cuts to savers. They have also agreed to sell between 125 and 150 supermarkets and a number of convenience stores if allowed to merge. According to Kantar's figures, Sainsbury's was the worst performer of all the big four supermarkets, which includes Tesco and Morrisons. Sainsbury's sales fall meant its performance lagged behind smaller rivals, such as Iceland and Co-op.